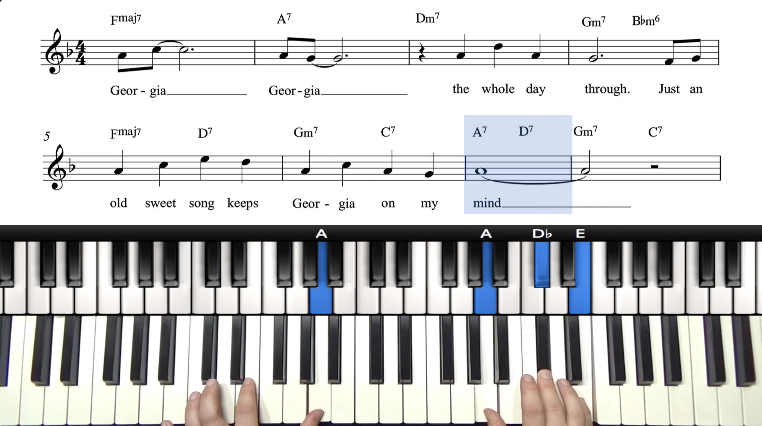 Welcome to the PianoGroove Community! Wow, it sounds fun to be the musical director in a church… What a wonderful place to share and teach music. Even though I am a competent pianist I decided to start at the jazz foundation course, quickly working my way through it. I’m working at the beginner’s course at the moment but I’ve also dipped into bits and pieces of the various other courses just to see where they’re going. I’m very tempted to jump in at the deep end but I’m trying to keep on track. I think it’s very important to have a firm knowledge of the basics in order to get to where you want to go with confidence. Yes we do recommend our students to start with the beginner courses to ensure they are comfortable with the foundations. With your previous musical experience I’m sure you will be familiar with much of the material but it’s certainly worth refreshing your knowledge. When it comes to learning I’ve found combining different sources particularly helpful not only in terms of theory but also as inspiration. I have quite a few jazz theory books lying around my piano but pianogroove is the by far the best teaching programme there is as it is a clear, and well organized tool for learning. Yes I agree it’s always good to search for different perspectives and sources of inspiration. 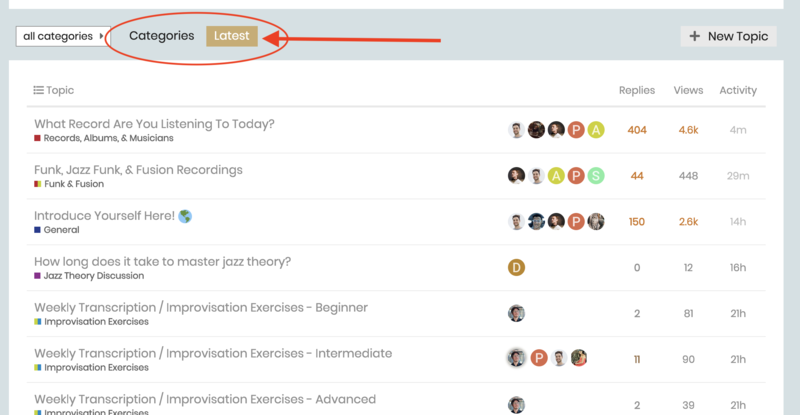 One of my goals with PianoGroove is to provide a wide range of teaching styles from our team of teachers. All of the styles we teach at PianoGroove are interrelated and the Beginner Jazz Lessons feed nicely into the rest of the syllabus. For example, to play the Bossa Nova and Samba lessons, it’s important for students to understand concepts such as chord extensions and rootless voicings which are covered in the Beginner section of our Jazz syllabus. 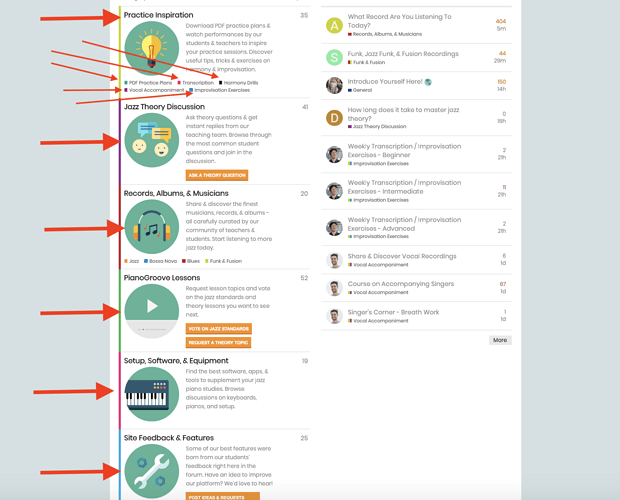 All of your progress is saved onto your Student Dashboard, so you can take multiple courses at once and keep track of your learning journey. My aim is to sound more like a ‘laid-back’ jazz pianist😎 and to improvise around a melody. I already do that to a certain extent in the worship band but it’s a different style of playing. If you read some of the posts above here, you will see my recommendations for developing at improvisation. Listening and transcription is very important and is the ultimate source of inspiration. I also need to work more on voicing and simplifying my style as I have a tendency to play big chords with left hand arpeggios, giving me thinking time. It sounds ok but not what I want. I’m also looking forward to learning more about walking bass lines as our band doesn’t have a bass player at the moment and I have to fill in the bass line as well as supporting the harmony and fill-ins. So far in this course I have spent way more time on theory than actual playing. Most of our Beginner & Intermediate Jazz Lessons are dedicated to teaching voicing styles and options and so you will find lots of advice and guidance within those courses. If you have any specific questions with voicings just let me know and I’m more than happy to help out. When playing without a bass player, generally we should be including the root in our voicings to establish the basis of the harmony. Lyndol provides a methodical approach, starting with simple triads and then gradually layering in the complexity with 7th chords, and extended harmony. This song is sooo sweet and so old. Written in 1930 by Hoagy Carmichael and Stuart Gorrell. There are endless versions and interpretations. Although I’ve spent my entire life creating music, I suspect I’m a bit hesitant in case I can’t put theory into practice. There are a lot of beginners who are far better than me. I’ve listened on the forum to other people’s playing and I’m very impressed by what they can do. If I’m not creating music I’m listening to it. For myself Anne, the key was understanding and accepting that there is no ‘finishing point’… there is always more to learn and so I like to look at it as a journey that I’m taking for the rest of my life. I find this outlook ‘takes the pressure off’ as sometimes it can be frustrating when progress is slow as it often is with learning jazz harmony. I just try to get a little better each day when I sit down at the piano. If anyone wants to ask me more about my job as a church musician go ahead. I’ve never joined an online forum before so I’m a little nervous but I have enjoyed reading it very much. Absolutely…we have plans to expand into all styles of improvised music and I’ll certainly be in touch when we are ready to develop the church/gospel side of the syllabus. Thank you for sharing your story - I enjoyed reading it and I’m sure our other students will too. There is lots of useful information and inspiration here in the forum so spend some time to familiarise yourself with the different areas. Enjoy the lessons and talk soon! Welcome Anne! I’m from Scotland myself - originally just east of Edinburgh and now living in the Scottish Borders, by way of all kinds of detours! I enjoyed reading your story - it’s great to hear how diverse people’s stories are on here. I have started to teach myself jazz piano as an adult, and have gravitated towards the Brazilian/bossa nova, fusion jazz and soul/funk styles on here. I’m feeling my way as I go too in terms of where I’m going. Welcome, It sounds like you are already very disciplined in your studies, for a balanced (yin-yang) be sure to take one of the tune lessons and just have fun with it. Enjoy this program. I do love my job. One of the things I particularly like about it is the wide variety of music which we produce. That’s partly because I enjoy all sorts of styles myself but our congregation is quite diverse in terms of age and likes so I try to deliver a variety of music. I have a choir made up of people who simply enjoy singing. I’m quite excited about their next project which is a gospel style. This style is new for them as they usually sing more traditional choir pieces. I let them hear it the other day and they loved it. The accompaniment is more bluesy and chordal as opposed to a tightly written accompaniment so this will give us a more relaxed sound. My son will accompany them so I can conduct. He’s brilliant at improvising. Apart for the choir, we also have a motet group. This group sings a cappella. They started out singing ancient music, eg William Byrd but recently we have tried out our vocal chords with jazz arrangments. It’s very challenging as you have to concentrate your listening skills as well as being accurate in pitch. There’s no piano or guitar to prop you up. Last but not least we have a worship band. They deliver contemporary church music and we are bang up to date with the latest songs. It’s a lot of fun playing in the band. We even create a variety of styles from within this group so all and all it’s a lot of music but it’s what makes people come back and stay. I was born in Scotland and grew up Protestant. I live in Canada now and the church I go to is Anglican so it’s a sort of mix between catholic and Protestant. It’s formal without being too formal. I’ve been told by many people that they come because they like the music. Music is a very powerful, emotional tool. I try and deliver something for most people every week. For example, this morning we had a couple of traditional hymns, the band sang a modern song, the choir sang an anthem and my daughter sang a contemporary worship song as a solo during the Eucharist. For that I followed a lead sheet and accompanied her, improvising round about what she was singing. I’ve done a lot of accompanying over the years but I still have a lot to learn about playing in a jazz style. Both my adult children are involved in the music. My daughter sings and plays drums, she can even do it at the same time! My son is also a drummer and an amazing keyboard player. How lovey to wake up to music. I sometimes go to sleep with music as my adult son still lives with us and he is an awesome keyboard player. I call it my Eine Kleine Nachtmusik. 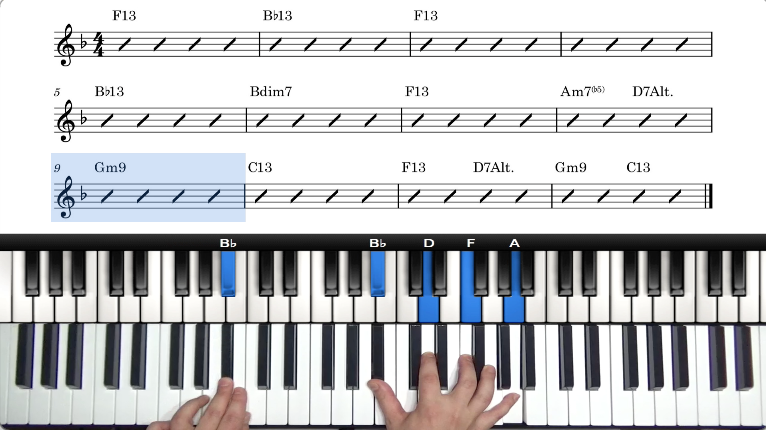 I’ve already started integrating some of my new knowledge from pianogroove into what I do. Thanks for the encouragement. I will continue to work on it. I’ve been told by many people that they come because they like the music. Music is a very powerful, emotional tool. I try and deliver something for most people every week. For example, this morning we had a couple of traditional hymns, the band sang a modern song, the choir sang an anthem and my daughter sang a contemporary worship song as a solo during the Eucharist. For that I followed a lead sheet and accompanied her, improvising round about what she was singing. It must be very rewarding to deliver these unique musical experiences for people attending your church each week. 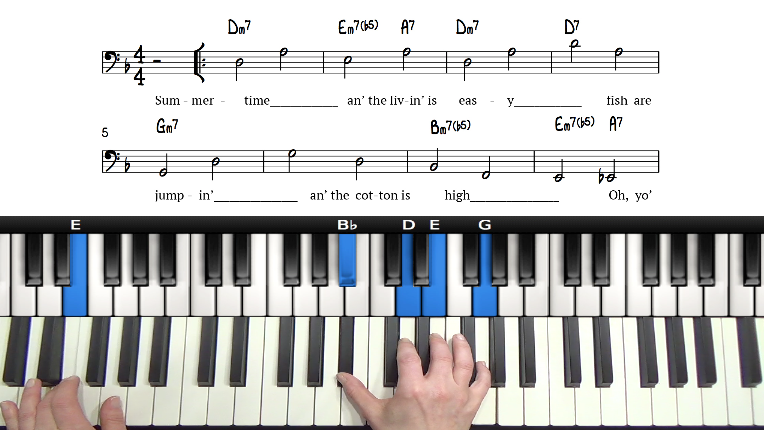 The jazz theory that we teach here at PianoGroove can be applied to both traditional hymns and modern songs. This is one of the beauties of learning jazz harmony, it gives us a deeper understanding of music that we can then apply in almost any musical situation. It makes me very happy to hear that our teachings are being shared with others; for me that is what music is all about. My name is Thomas, I am 38 years old and I am living in Berlin. I took piano lessons for 10 years while I was going to school. I only played classical music at that time (Chopin is my favorite composer) and I got quite far - I was able to play a few Etudes at the end - but although my teacher was actually a Jazz pianist, I never learned music theory or how to improvise from him. When I moved to Berlin, I started playing the piano again - mostly modern classical pieces from Artists like Nils Frahm, Ludovico Einaudi or Julien Marchal just by listening to them. But I also wanted to be able to improvise, playing Jazz standards, accompany a singer and work on my own songs… I tried to find a Jazz teacher but that did not work well, so I decided to sign up here and I have to say this is exactly what I was looking for! I love how the tutorials are structured and slowly making progress with the beginner lessons. I also bought some theory books like Mark Levine´s Jazz Piano but watching a video and listening to someone works far better for me so far. Looking forward to spending more time with the tutorials and in the forum! Welcome to pianogroove Thomas. I’m sure you will find what you are looking for here. I’m fairly new too and I have found this community both encouraging and inspiring so I would advise you to keep in contact with it. I enjoyed your playlist but I particularly enjoyed the Thomas Nau whatever#3. Enjoyed the music, especially whatever #3. Welcome. I to have a classical background. Piano Groove is really helping with my transition into the jazz world. Dr. Dean. Just a beginner here also. Thanks for sharing your wonderful album. I listened to a few of your performances and they are beautifully played. There’s some of my favourite composers in there too. What an eclectic mix of music from Chopin to Nils Frahm! Awesome, it sounds like you are in the right place! Understand the importance of transcription. Here’s an introduction course on transcription, and try some of Tuomo’s transcription exercises which were just launched today. We are also launching a new Vocal Accompaniment section shortly which has vocal-play-a-long tracks for our students to practice the art of accompaniment. More to be announced shortly. I tried to find a Jazz teacher but that did not work well, so I decided to sign up here and I have to say this is exactly what I was looking for! I love how the tutorials are structured and slowly making progress with the beginner lessons. Great to hear you like the structure of the PianoGroove syllabus. I recommend that students study multiple courses at once. All progress is saved to your dashboard so it’s easy to keep track of your learning journey. 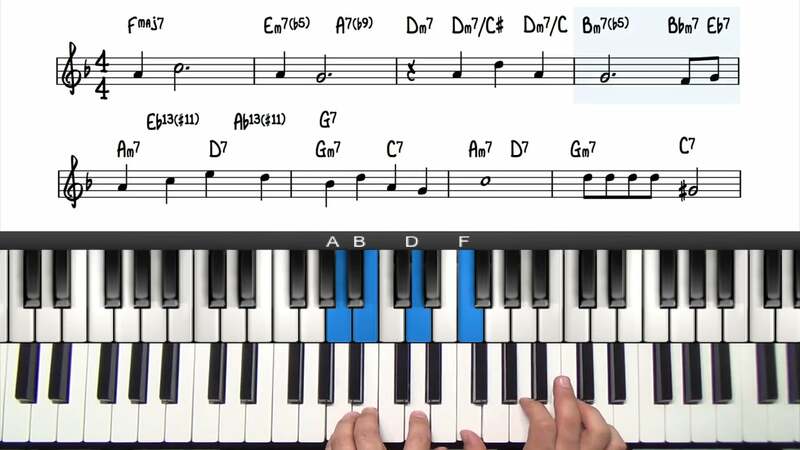 The Beginner Jazz Lessons feed into most material on the site, so if you have interest in other genres - such as Bossa Nova - it’s a good idea to learn the basic jazz theory including chord extensions, rootless voicings, and altered harmony. The key is a lot of listening and transcription Thomas. If you scan through some of my replies in this thread you will get a lot of insight into how to go about. Particularly with you coming from a classical background, listening is incredibly important to absorb the feel and articulation of jazz music. Of course spend the time to study the theoretical aspect of the PianoGroove syllabus, but always remember to spend a lot of time listening too - it is the ultimate source of inspiration. Brilliant. If you need any help or guidance don’t hesitate to ask here in the community. Welcome Thomas! You’ve made a good choice. PianoGroove seems to work well for nearly everyone here, whatever their background or level of playing. And those are quite varied. Thanks for sharing your music. With your technique and a bit of study and lot of listening, you’ll be up to speed in no time. Have fun. You might think that’s brilliant… well, it’s not if you take into account that I understood NOTHING of what I was playing. I was just like a little monkey copying what’s written and playing all the corresponding notes. BTW, I can still play “Until the Last Moment” after all these years, but it’s only muscle memory. To fully understand it, I’d need to re-learn this song by analyzing it. Thank you, looking forward to learning some real piano! I’m glad you are enjoying the PianoGroove teaching style. Any theory questions you have, you can get quick replies from our teaching team and students here in the forum. 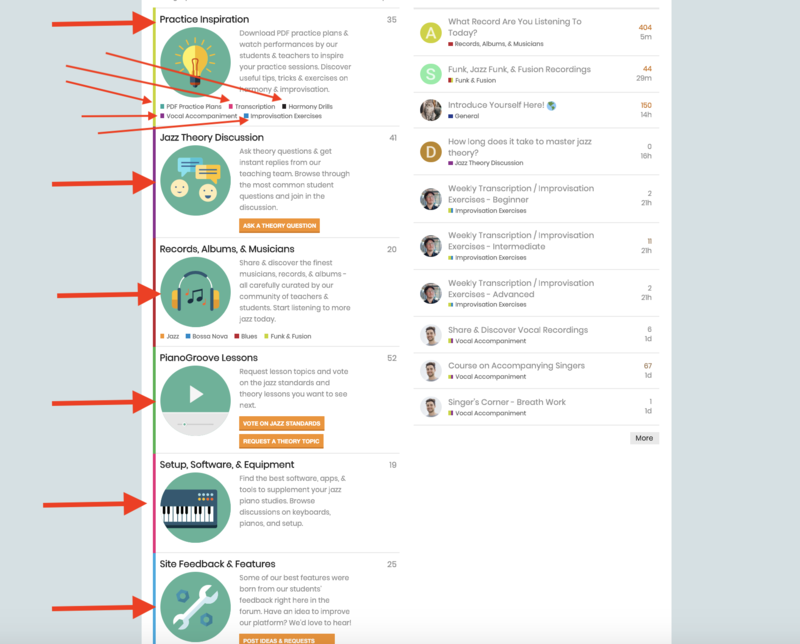 The forum is constantly evolving so you will see new sections appearing, but the above should give you a good overview of how to navigate the different forum categories. I’ll also make an explainer video of the above, I think that would be nice for new students joining us.